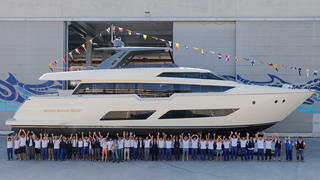 The first hull in the Ferretti 850 series has been completed and launched at the yard’s Cattolica facility. The Italian yard revealed the new 26 metre superyacht has already been sold, along with the next two hulls in the series. One of the hulls is sold to the Americas and two to Europe. Interior and exterior design was developed in conjunction with Studio Zuccon International Project. The Ferretti 850 is an all-GRP construction featuring large hull windows and an extensive flybridge. With a 6.28 metre beam, the first hull will feature accommodation for eight guests and a crew of three. Featuring a fast-planing hull and naval architecture by Advanced Yacht Technology, the Ferretti 850 has been designed to deliver a fast cruising speed of 26 knots. Twin 1,775hp MAN V12 diesel engines mean a top speed of 29 knots will be possible, while the 6,750 litre fuel tank should deliver a maximum cruising range of 310 nautical miles. Built to RI classification, the Ferretti 850 features teak decks and a foredeck seating area for added privacy. Ferretti Group added that the first hull in the 850 series will go on display at both the Cannes Yachting Festival and the Fort Lauderdale International Bow Show later this year. Other upcoming projects from the Ferretti Group include the 50 metre CRN yacht Project Superconero, which is due to be delivered in 2017.